Travellers are very anxious to know if the destination they are heading to has a beach. Beaches are very popular for the ideal holiday setting they offer; that of laid-back calm. It is the perfect place to relax and rejuvenate and an ideal escape from the rest of the world. The golden sand, the frothy waters and the fresh sea breeze is a perfect escapade for one and all. There are many beaches in India where you can head to and enjoy the beauty of nature. Both tourists and locals throng these beaches to spend time with their loved ones and family. Here is a guide to ten stunning beaches you should visit in India. Bangaram is often called the honeymooner's paradise. It is rich in marine and land base fauna and you can catch a glimpse of various kinds of birds, fish, porcupines and parrots here. Scuba diving and Snorkeling excursions promise a spectacular view to what lies beneath the water surface for the travellers. If you get tired of the beach then take a walk through the island's lush and vast coconut grove. A must visit place in Mumbai is the Juhu Beach. Located near the posh area of Mumbai,the beach attracts both locals as well as tourists. The best time to visit the beach is during the evening. One can smell the aroma of the street food from afar. Do dig into the hot and spicy vada pavs or the steaming plate of pav bhajis. One can also ty out the ice golas which is a local favourite and the faloodas. You would be lucky if you catch a glimse of a Bollywood star here. This place is filled with surprises for everyone. Kanyakumari Beach is a beach destination as well as religious spot located towards the southern-most tip of peninsular India. 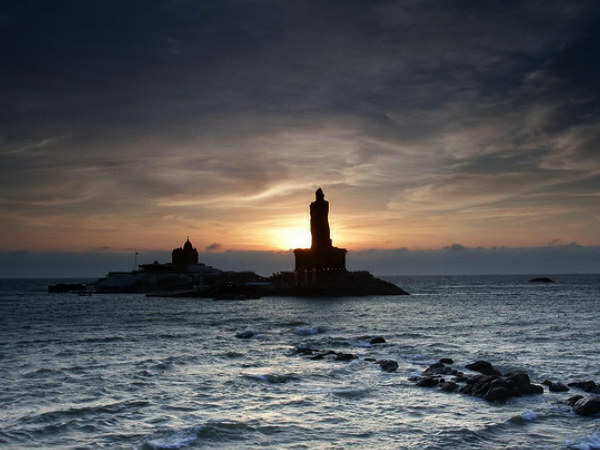 The sun set and sun rise at Kanyakumari Beach, especially during full moon days in April, are highly popular among visitors. During this time, visitors can watch both sunset and moon rise simultaneously here. It has rocky shores and the sea is rough due to the confluence of the three waters - Arabian Sea, Bay of Bengal and Indian Ocean. The sand of Kanyakumari Beach is famous for its softness and various hues. A major tourist place in Udupi is the Kaup Beach which is known for its serene surroundings and soothing climate. Tourists coming here can enjoy a dip in the cool waters or just lay on the sand and be sunbathed. It is an ideal spot for going on a picnic with your family as well. also the best place for swimming and sunbathing. The Lighthouse Beach is located at the southernmost tip of theKovalamcoastline. The beach enjoys plenty of tourist attraction because of its proximity to the town. In olden days the hillock next to the beach had a lighthouse, called the Vizhinjam Lighthouse, and it was responsible for guiding ships that were entering or leaving the port. When European tourists started coming to the town they named this beach as the Lighthouse Beach because of the presence of the lighthouse. Fortunately for us, the passage of time and the ravages of nature have not affected the lighthouse. The flashing beams from theLighthousebestow an ethereal quality to the beach at night. Therefore, the beach is a must visit at night solely to witness this breathtaking site. Mahabalipuram Beach is located at the distance of 58 km south of Chennai, lying at the shore of Bay Of Bengal. This 20 km long beach came into notice only after 20th century. The beach is popular among tourists for indulging in beach activities like sunbathing, diving, wind surfing and motor boating. The beach is thronged by tourists during the months of November and February. Beside the beautiful beach are various monuments, rock-cut temples and Monolithic Rathas. Palolem Beach is located within 2.5 kilometres of the market town ofChaudiinSouth Goa, and about 40 minutes fromMargao. It is largely unspoiled and is inhabited by both local fishermen and by foreign tourists who live in shacks along the shore or in the main village itself.It is about one mile long and is crescent-shaped; you can view the entire beach from either end. Both ends of the beach consist of rocks jutting out into the sea. The depth of the sea increases gradually, being shallowest at the northern end of the beach, making it safe for average swimmers, and the currents are not fast. This beach was featured as the Goan residence ofJason Bourne in the movieThe Bourne Supremacy(2004). Payyambalam Beach is a popular tourist attraction in the region of Kannur and is situated at a diatnce of about 2 km from the town. The major attraction here is a magnificent sculpture of a mother and a child. The beach has a well maintained garden adjacent to it where people can spend their evening watching the beauty of the roaring ocean. One will find families, visitors, tourists and youngsters thronging the beach during the evening taking in the beautiful site of the setting sun. Puri Beach, on the shores of the Bay of Bengal is just 2 kilometres away from the Puri Railway Station. It is a popular tourist attraction in the city and is considered to be one of the best beaches in India that is ideal for swimming. Hindus also consider the beach to be sacred. The annual Puri Beach Festival displays sand art which draws plenty of tourists. International award winning local sand artist Sudarsan Pattnaik's work offers a visual treat and is a must watch if you are inPuriduring the festival. The rich golden sand on the long beach along the bay, the soothing breeze, the clear twinkling water and the breathtaking view of the sunrise as well as the sunset have made the beach a permanent attraction. One of the places to visit in Varkala is the Varkala Beach, known for the Vavu Beli, a Hindu ritual performed here. Tourists coming here can enjoy the sandy beaches, the calm sea and the cool sea breeze. It is a perfect place to either relax under the sun or to indulge in some beach games like volleyball.